Cristina Braga holds the role of Communications Assistant at the United Nations University Operating Unit on Policy-Driven Electronic Governance (UNU-EGOV) since January 2018. Cristina has a multidisciplinary profile and professional course. She worked as a photography and stopmotion teacher, as a freelancer designer, studied Portuguese anonymous culture, and also worked in a publisher of school books. Her responsibilities at UNU-EGOV include creating graphic content for the Operating Unitand providing solutions for the branding, social media, and graphic identity. 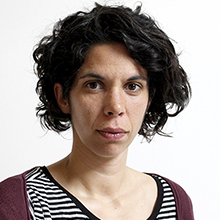 Cristina holds a BA in Communication Design from the Fine Arts School at the University of Porto and a Master’s degree in Image Design from the same university.